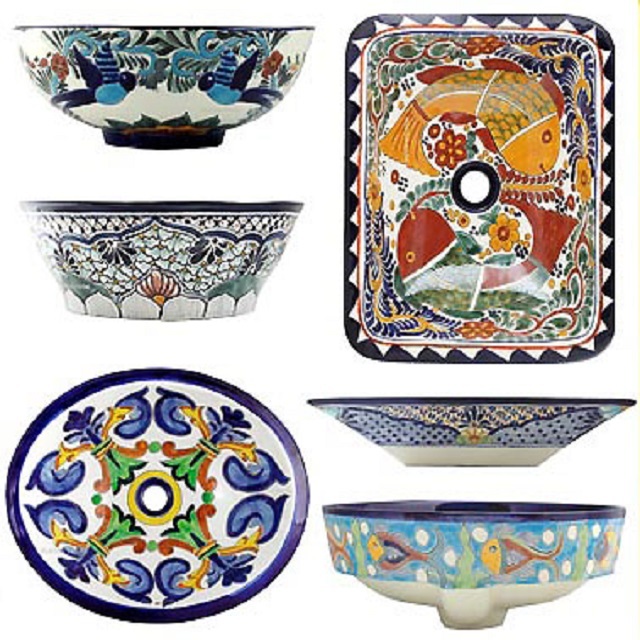 Click the button below to add the Talavera Sink "Green Peacock" to your wish list. A handmade oval sink painted with "Green Peacock" pattern was developed for undermount and drop-in installation. The ideal sink #TS011 application is a transparent glass counter over the bathroom cabinet or an iron stand. It comes in three sizes. The decoration is hand crafted so it might slightly vary when looking at the photo with the original design. The talavera sink is painted inside and outside. All sizes are equipped with a drain back system connecting the upper and bottom drain preventing water from spilling over the edge to the bathroom floor. This oval sink can be used with stone, wood and glass counters or an iron base. When installing on the wood based counter place the sink #TS011 upside down and draw on the countertop line around it. Then, make an additional one about 3/4" inside the outer line. The second will be used for cutting the opening in the bathroom counter. Drill 3/8" starter hole on the line and begin cutting the the countertop. Then cut the the area between the first and second line. Drop the sink into the opening. Place plumber's putty around the oval sink bottom edge of the drain-assembly lip and press the housing into the drain hole. Attach the gasket with a washer and tighten the locknut by hand. Using the wrench will damage the talavera ceramic. if you didn't install the faucet yet turn the bathroom sink upside down and place silicone along the lip. Align it with the counter edges, press firmly along the lip to form a tight seal. Set the sink in place firmly pressing down to assure adequate contact. Rustica House is not responsible for any damage caused by the direct or indirect use of this article. We recommend contracting a licensed plumber for the handmade talavera sink bathroom installation.